To keep kids from loading up on candy, the trick is to fill them up with cute and appealing, but also healthy Halloween snacks. Try serving these snacks at your Halloween party, or just for your family before you hit the streets for treats. These options are clever enough to tempt kids' palates but low on sugar. No-bones-about-it vegetable skeleton: Veggies come in so many shapes and sizes, they make perfect building blocks ... or bones on a cute-enough-to-eat skeleton. (Use thick, pasty hummus to keep bones in place on your platter if they slide around.) Check out the photo for inspiration. Whitney Moss of RookieMoms.com served it at her son's birthday party. Since he was born on October 29, Whitney says, "he'll have this at every party for life!" 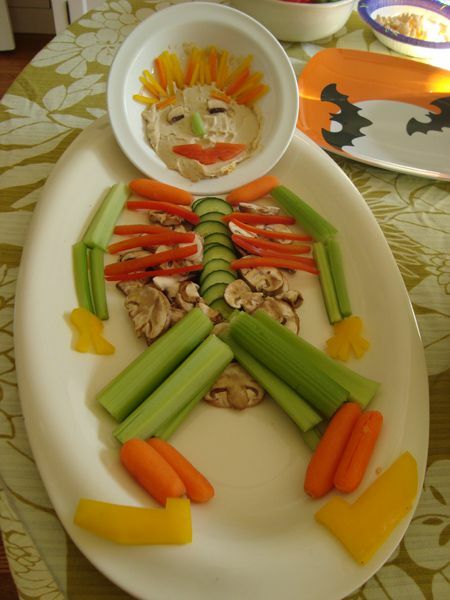 Jack-'o-lantern dip: Carve out a small pumpkin (or a few) to hold dip, and serve alongside kid-friendly raw vegetables. Healthier dip choices include salsa, hummus, and yogurt-based recipes. Paint a face on the pumpkin instead of cutting holes, or cut only partway through. Or if you're feeling extra-spooky, carve a large mouth and make the dip spill out through it for a "puking pumpkin" effect. Black-and-orange dip: Buy or prepare black bean dip, and serve with sweet potato chips, orange bell pepper strips, and carrot sticks. Get seedy: Don't forget to save your seeds when you carve pumpkins. Roast them in a hot oven with a little salt and olive oil. Braaaaiiiins! Score major cool points with party guests by serving a watermelon carved to look like a brain. Choose a small, seedless melon and peel off the green skin. Score the white pith with a knife to resemble the brain's squiggly folds. Then carve to expose a little of the watermelon's red flesh. Boo-nanas: Dip peeled bananas in orange juice, then roll in shredded coconut to make white ghosts. Add small raisins or chocolate chips for eyes, then insert wooden craft stick for a handle (so the ghosts can flit about hauntingly). Serve as-is or frozen. Witches' teeth: Core and quarter an apple. Remove a wedge from the skin side of each quarter to form a mouth. Insert variously shaped and sized slivered almonds for teeth. Orange-'o-lantern: Use a toothpick to carve features into the skin of a whole orange. Insert a piece of pretzel for a stem. Or remove the fruit's pulp and use as a small bowl to serve yogurt, low-fat pudding, applesauce, etc. Pumpkin muffins: Try a healthier, low-fat recipe; no one will know the difference. Sand-witches: Spook up ordinary sandwiches by making them into Halloween shapes with cookie cutters. Choose whole-wheat bread and healthy fillings such as natural (no sugar added) peanut butter, fruit preserves, turkey slices, and so on. Hallo-pizzas: Buy a whole-wheat pizza crust and top with tomato sauce, part-skim mozzarella cheese, and orange bell peppers and black olives (for their seasonal colors; make a plain pie for pickier eaters too). Or let kids make their own mini pizzas on small prepared crusts or on whole-wheat flatbread or bagels. Face it: Stir a few drops of food coloring into low-fat cream cheese to turn it orange. Spread on whole-wheat English muffins or bagels, then give kids raisins so they can make a jack-'o-lantern face.